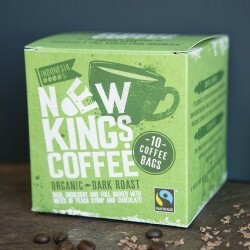 Founder Jason had the idea for New Kings Coffee during his previous corporate career, after being disappointed with the lack of selection of coffees at hotels and conferences. 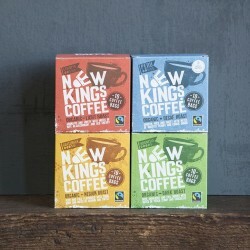 New Kings Coffee supply a diverse range of high quality coffees from around the world, with the aim to help others to explore a variety of roasts, aromas and tastes. 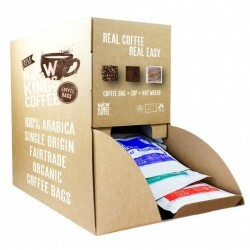 Their brew-in-the-cup coffee bags provide a quick, convenient and mess-free way to enjoy a great tasting cup of fresh coffee. 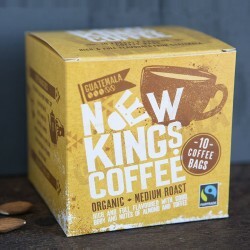 All of their coffees are single origin, Fairtrade and Organic, ensuring that they provide only the very best, whilst supporting the people and environments in the coffee growing regions.